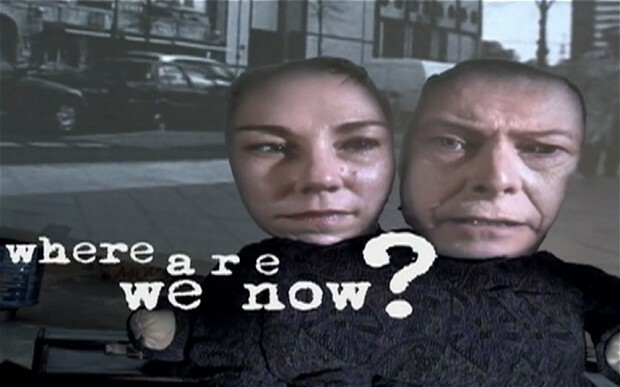 You can listen to 'Where are we now?' here. As my birthday is close to David Bowie's, I always say somewhere on that day "and soon it's David Bowie's birthday (and would have been Elvis'"). This year over dinner and I followed this up by this remark: "and we are never going to hear from him again". David Bowie is in retirement for whatever reason, I reckoned. So who measured my surprise when in a retweeted tweet I was alerted to a new David Bowie song on the 8th of January. I was #373 listening to the video on You Tube. Listening to a new song from someone I heard the first song from in 1969 and still one of my favourite songs ever, 'Space oddity' of course. 'John, I'm only dancing' is the oldest record I own of Bowie that is not second hand. 1972! Listening to Where are we now? for the first time was not a total pleasure. The song is slow, laden and Bowie sounds very fragile. But then, almost no new song by an old hero of mine falls right the first time. Too much competition to fight itself into. But a few days later, I'm already changing my opinion. 'Where are we now?' may well prove his best song in more than two decades. Just like in the video, Bowie is not trying to be anyone but himself. There's is no forced sign of the times (dance) influences in the song. Just this beautiful music. This sound that slowly swells like a wave reaching the beach and slowly fades out like the water retreating back into the sea. So I did change my opinion listening again after the initial surprise and yes, I am looking forward to hear the new album, something I had not expected ever to do again. What was really telling about Bowie's stature in rock music, is that all newspapers my eyes fell on on 8 and 9 January had an item on Bowie's first single in 10 years. (It can't be that long I thought, but who knows.) At 66 he's still making news. What do you think of David Bowie's come back? The general opinion seems to be that you have to listen to this number a few times to enjoy it fully. I was #613624 at youtube so numbers are growing. Compared to his younger years his voice really is fragile. Especially in the firtst lines. But, if we hadn't known his voice in those years and we would have heard him now for the first time, would we appreciate his voice as it is now? I'm not completely sure about that. Do we give him credit because of what he was (and yes, I also have cd's from him)? Yes, I believe most of us do. I will keep on enjoying his earlier work, I will listen to this number a few times (at two times now) and I will judge it on it's merits now. For me the question is if I would by the cd. Up till now the answer must be: 'no'. But, time will tell. I also didn't like classical music when I was young.